It has been a tough week for me as some unfortunate events happened. I shall not go into the details of what happened but rather focus on the planning aspects before any unfortunate events happen in our lives. The lasting power of attorney or LPA in short is a legal document which allows a person to voluntarily appoint one or more persons ('donee(s)') to make decisions and act on his behalf should he lose mental capacity one day. A donee can be appointed to act in the two broad areas of personal welfare and property & affairs matters. I first heard of LPA a few years back from a colleague but didn't really understand how important it was. A point to note is LPA is only useful if someone is still alive but cannot make decisions himself. If he passes away, only a will drafted by legal representatives can be used. LPA is getting more and more important that the government actually waived the application fees since 2014. The waiver is stipulated to end next year. If you're interested to find out more about LPA, you can click here. To apply for LPA, click here. I will be doing this for my parents immediately. If you do not have LPA at that time when something happens, you'll have to apply to the court for a deputy to act on behalf of a family member and it can be a tiring and long process at that time. So its better to get an LPA ready now. Another very important thing we must have is hospitalisation insurance. Hospital bills are not cheap at all and it can be stressful to handle the bills while having to take care of your loved ones. All Singaporeans including permanent residents are protected automatically under a basic healthcare insurance called Medishield Life. This insurance covers for life even for those with serious medical conditions currently up to B2 ward in the hospital. For the detailed benefits, you can refer here. Medishield life is indeed just basic. If we want to have better healthcare coverage, we can get it from a private insurer. I'm sure many of us know about this. We can cover up to private hospital and even cover fully such that we don't have to pay a single cent for the hospital bills. Something to take note when buying hospitalisation insurance is the deductible and the co-insurance. We can cover these 2 through riders where the premiums have to be paid in cash. You can consult a financial consultant for the various hospitalisation plans out there. 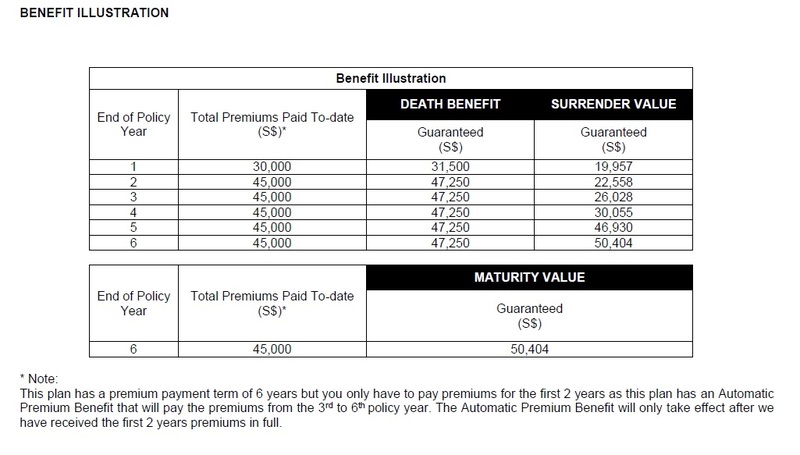 Besides hospitalisation insurance, all Singaporeans above the age of 40 are also covered under Eldershield. This is an insurance which pays out a monthly sum of money should we be severely disabled. “Severe disability” is the inability of an individual to perform at least three of the six Activities of Daily Living (ADLs) independently, with or without mobility aids (e.g. walking aids, wheelchair). This means that the individual will require the physical assistance of another person for the ADL. Under the Eldershield, we can receive $300 or $400 up to 6 years. Be sure to check if you or your loved ones is covered under Eldershield as they may have opted out unknowingly. Log on to the Central Provident Fund (CPF) Board website with your SingPass. After logging in, please select “My Messages” and check under the “Healthcare” section. If you are covered under ElderShield, this section will also let you know the ElderShield insurer you are covered under*. * If you are not covered under ElderShield, the CPF website will not reflect any infomation on ElderShield. I checked my father's Eldershield and was surprised that he was not covered under it. He had no recollection of opting out also so its good if we check. 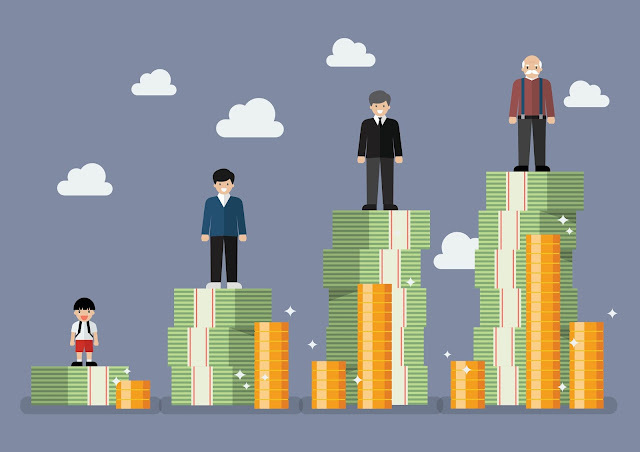 If you are looking for higher disability income, the eldershield can be upgraded or you can get a seperate disability income insurance. For HDB, you can also get a private mortgage reducing term insurance and opt out of the HPS. But, it would not be that wise of a choice as I think HPS will be easier to claim in the event anything happens. HPS will just offset all the outstanding loans while for private mortgage insurance, they will pay out in cash and it may take some time. For private properties, it would also be wise to take up a mortgage term insurance. Private properties mortgage amounts will be even higher than HDB so it is better to cover ourselves. After an unfortunate event be it death or critical illness or disability, there will be a lost of income where your dependants may have some financial difficulties thereafter. A basic term insurance pays out a lumpsum amount upon death. Riders can be added to increase the coverage to pay upon critical illness or total permanent disability. The younger we get the term insurance, the more affordable the premiums will be. It can be as low as $100+ per month for a 1 Million coverage. Of course, being a term insurance, we will not get anything back vs if we have bought a whole life insurance. For myself, I go for the term insurance because it would be impossible to pay the premiums for high coverage with a whole life insurance. No matter how much planning we do, staying healthy is still the most important. Regular health check ups also help in detecting problems early. For Singaporeans age 40 and above, there is a government scheme which allows for health screening at $5. You can refer here for the information. You will get a letter on it too so do look out for it. Most people would have already received the letter. For us who are younger than 40, we can encourage our parents to go for it and for ourselves, it is also important to go for health check ups too. Eat healthy, exercise and stay healthy. Having a balance life with lesser stress also helps too. Hope the above planning tips are useful for your future. Where To Put Your Money To Save For Better Returns? Interest rates are so low in our bank accounts that it virtually earns close to zero interest. Gone are the days where we see higher interest in the bank account where it was once as high as 9.5% as offered by POSB in the 1980s. Now, there are other higher interest/savings account which offers 1%-3% interest but there are various criteria to meet such as paying bills, buying investment products and meeting the minimum credit card spend. During my school days, someone approached me to do a survey and subsequently told me of a higher interest product which is known as an endowment plan. Being young that time, I was convinced that this was the better option than just putting my money in the bank account. Little did I know after 10 years, the plan is not even halfway through as it takes 25 years to mature. I'm sure many of us have bought into similar plans in one way or another and still paying for it after many years. It seems like it’s never ending. Saving for life goals. The Shorter Way. While there are many savings plan out there which many people put their money in to achieve certain savings goals and at the same time compound it, 25-year term for most endowment plans is too long for short term goals such as marriage, buying a house or even saving for a child's education. There are other guaranteed returns investment tools such as the Singapore Savings Bonds (SSB) which are capital guaranteed and pay out a fixed rate coupon to us. However, it can be hard to plan for our savings with this as we need to buy and sell the bonds and there will always be the desire to sell it for a profit. Nevertheless, it is a safe and guaranteed low risk investment option. Apart from the SSB, I recently found out a new savings plan by the Maybank Group's Etiqa Insurance which provides relative short term plans with guaranteed interest rates. The shortest term is 6 years with 2.02% p.a. guaranteed return. They also have longer term plans which offer higher interest. The good thing about it is that it is capital guaranteed so no matter what, you will get your initial savings back and will not lose a single cent. At this point, maybe some of you may have questions on how does it work, is it risky and does it seem too good to be true? I went on to probe further and got more information as much as possible. This is the simplest of all plans which pays out guaranteed 112% upon maturity after 6 years. We only need to pay for the premiums for 2 years though. There is also death protection of 105% of total premium paid throughout policy term and additional accidental death protection at 100% of premiums paid throughout premium term. There are other similar plans such as the one from FWD insurance which also gives 2.02% p.a. Even though the term is shorter at 3 years, it is important to note that FWD’s credit rating is BAA3 which is lower than Etiqa’s A- rating. This seems like an enhanced version of the eEASY save with higher interest for those who want to grow their money further. To get 4.02% p,a,, we will have to go for the 15-year plan. The capital is still guaranteed for eEASY savepro plan so we are assured that we will not lose our money. The lowest is still the 6-year plan which gives 2.65% p.a., slightly higher than the eEASY save although interest is projected. The same death protection and additional accidental death protection apply. For a summary and more details of the plans, you can refer to their websit. Before putting our money into any place, it is important that we know more about the company. Some of us may know Etiqa when we buy our fire insurance for our HDB flats. They are the (only) HDB-approved Fire Insurer and have been protecting more than 300,000 homes since 2009. They also have competitive travel insurance which some of you may have bought before. Their travel insurance even has automatic flight delay notification which will send us a sms text if our flight is delayed and once we qualify for a claim, it will also be automatically be processed without the hassle of making the claims ourselves. Etiqa is 69% owned by Maybank and AGEAS, a multinational insurance company, and is regulated by MAS. In view of the above, Etiqa is credible and is a safe place to put our money. Let's take a look at some of the life goals we can save up for. Getting married requires some savings to begin with. Maybe you're in your 20s and thinking of getting married in the near future. A 6-year savings plan can come in handy with guaranteed return and guaranteed capital. 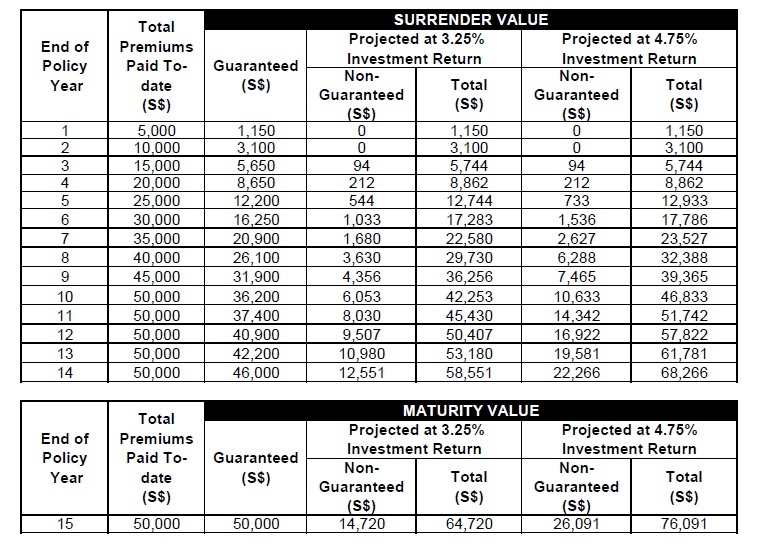 Maybe we can look at eEASY save’s $45,000, 6 year plan which will pay out a guaranteed $50,404 at maturity. It's that simple, just pay the premiums for 2 years and get 2.02% p.a. guaranteed return on your money in 6 years’ time. The premiums will be $30,000 for first year and $15,000 (half of first year premium) for second year. It may be quite hard though if you do not have that much savings in the first place. If you have some savings already, it will be good to park it somewhere to use for your marriage later. At the same time, you can earn some guaranteed interest on your money. Some may say the returns are quite low which I agree to a certain extent. However, I will think it is good to save our money which is critical for future use. This will be a good financial planning consideration where our money is assured to be safe and is not left in the bank earning close to no interest. A normal savings account only earn us about 0.05% interest which is exceptionally low. Another important life goal is saving for your child's education. Some of us may have bought endowment plans for this purpose as well. However, we will realise by now that endowment plans are not capital guaranteed and the investment returns are not high too. Many times, we will be locking our money for 25 years and getting only about 3% projected returns. I've checked Etiqa's eEASY savepro 15-year plan, which we can get 4.02% p.a.. The investment return is projected only but your capital will be guaranteed. This can be slightly complicated so let me summarise. For the plan, we will pay $5,000 every year for 10 years. The plan will mature at the end of 15 years. The maturity yield is listed on their website as 4.02% p.a. which is a projected value. The maturity value is the amount we see under the "projected at 4.75% investment return", S$76,091. 4.75% investment return here refers to the investment return on the participating fund while 4.02% p.a. is the projected return to the customer. The maturity value is also calculated using compound interest of the projected 4.02% p.a. interest. They have other plans with policy terms of 6, 7, 9, 11, 13 and 15 years and premium sizes of $5,000, $10,000, $30,000, $50,000, $80,000 and $100,000. It is quite flexible to plan for our life goals with some certainty that we will not lose our money. By now, some of us may be concerned of whether the plans can deliver its projected returns. This applies for the eEASY savepro plan. I managed to get some information on Etiqa’s overall participating fund's asset mix where 65.6% is invested in bonds, 21.4% in equities, 11.3% in cash & deposits and 1.7% in loans and others. While eEASY savepro is part of this participating fund, this asset mix is not representative of eEASY savepro’s specific portfolio as premiums paid are pooled with those of other participating policies offered by Etiqa. The top 5 equity holdings is in OCBC (12%), DBS (10.6%), UOB (10.1%), Singtel (5.8%) and Keppel Corporation (4%). For bonds, the top few are the Singapore Government bond, Australia & New Zealand bank bonds and also Dai-ichi Life. In 2016, the fund generated a return of 3.97%. I am still a firm believer in investing my own money but at the same time a portion of it should also be in a safe place for any future goals. Better returns with capital protection is a safe way to save for our life goals. We do not want to end up losing money and jeopardising our future and the future of the people around us. Currently, for eEASY savepro, they are giving out vouchers based on 1.5% of the 1st year premium size, and up to $1,500 worth of Takashimaya vouchers. While, for eEASY save, the deal involves up to $1,300 worth of Takashimaya vouchers which will increase the interest rate to 2.18% p.a. from 2.02% p.a. instantly.. Each of these deals are limited to 5 coupons per day. Just head over to their website to grab the coupons. If you like to take a closer look at the plans above, you can refer to their website . The good thing is you can do everything online and get immediate approval so it saves the time and hassle of meeting an agent and possibly overbuying on plans which you do not really need. This article is written in collaboration with Etiqa Insurance. All ideas portrayed are independent by SG Young Investment. I've been constantly sourcing for a high interest savings account to park my savings as I always believe in making my money work harder for me. Many of my friends have done it too and transferred their savings to OCBC 360, UOB One, Standard Chartered or even CIMB. I opened a few accounts too just to ensure my savings earn a higher interest. Where did I transfer my savings from? The answer is POSB/DBS. I have been using a POSB/DBS savings account for a very long time since I was a child. As they have the most ATM machines in Singapore, most people have a POSB/DBS account as their basic savings account. And for the longest time, I've been trying to find out if POSB/DBS has a high interest savings account so that I could consolidate all my money in one bank. They have joined the competition to provide a high interest account in the market right now with the revamp of the DBS Multiplier account. This is definitely a game-changer! It is attractive, flexible, easy to use and most important of all, many of us would already have a DBS/POSB savings account which makes it easier to integrate. The new DBS multiplier account is quite different from the other banks as they have removed most of the pain points to getting higher interest. This is also different from their previous multiplier account which is not that attractive. Most of us would know that you need a minimum salary credit of at least $2000, pay 3 different bills, meet a minimum credit card spend just to get higher interest from banks such as OCBC, UOB etc. Now, all these will change with the new DBS multiplier account. DBS allows you to earn higher interest with NO minimum salary credit, NO requirement to pay any bills and NO minimum credit card spend. The minimum interest you can get is 1.55% p.a. just by fulfilling 2 simple requirements with total eligible transactions at $2000 or more per month. You can get up to 3.50% p.a. too by fulfilling more conditions. The first thing you need to do is to have your salary credited into any DBS or POSB savings account. This means if you already have your salary credited to your existing DBS/POSB savings account, you don't have to make additional changes to it. Remember there is no minimum salary credit to enjoy higher interest. 2) Salary Credit + Additional 1 Other Requirement - Enjoy min 1.55% p.a. and up to 2.08% p.a. As long as your salary credit and 1 other requirement meets a minimum of $2000, you will enjoy higher bonus interest on the first $50,000 balance. For credit card spend, it is applicable to any DBS/POSB credit cards (not applicable to debit cards). For investments, it is applicable to unit trusts (including POSB invest saver), online equity trades etc. For insurance, it is applicable to any purchase of insurance with DBS/POSB. For housing loan, it is applicable to any monthly instalment payment for housing loan with DBS/POSB. For example, if you have a salary credit of S$2400 with any DBS/POSB savings account and you have some spending on your DBS/POSB credit card, you'll be eligible for the 1.55% p.a. interest. Even a $1 credit card spend will allow you to earn that higher interest. If you have a higher salary credit plus credit card spend adding up to S$2,500 and above, you will get even higher interest at 1.85% p.a. 3) Salary Credit + Additional 2 Other Requirements - Enjoy min 1.80% p.a. and up to 3.50% p.a. For example, if you have a salary credit on any POSB/DBS savings account and some spending on any DBS/POSB credit cards plus you have either monthly investments on POSB invest saver or monthly home loan instalments with DBS/POSB, you will get at least 1.80% p.a. For this segment, I believe if we have a salary credit + additional 2 other requirements, we can easily get more than 2% p.a. Not too difficult to have a total transactions above S$2,500 for this. How Much Interest Can You Typically Earn? I think this new multiplier account from DBS really makes it easier to earn higher interest. Its easier and more flexible than the other existing products out there in the market. Let's do some scenarios and see how much interest can one typically earn? Most fresh graduates are likely to have at least a $2,000 salary credited into their bank. Some might even earn more. For an additional 1 other requirement, the easiest will be the credit card spend. As the new DBS multiplier account doesn't require any minimum salary credit or spending, once you have $2,000 salary credited, you've already fulfilled the minimum criteria. For the credit card spend, there is no pressure to spend a minimum just to meet the criteria to get a higher interest. Let's just assume that the spending is just $100 and total eligible transactions will be $2,100 which enables one to earn an interest of 1.55% p.a. For a savings of $10,000, total interest earned will be S$153.30 annually. If this fresh graduate spends more and chalks up $500 in credit card spending per month, total eligible transactions will be $2500, which enables one to earn an interest of 1.85% p.a. For the same savings of $10,000, the interest earned will be S$182.50 annually. *Note: Most credit cards application require annual gross income of $30,000. If you still hold a student credit card, it is eligible for higher interest criteria as well. For a young working adult, he would have rose up the corporate ladder and gotten a higher salary by now. Assuming he has a salary credit with DBS of $4900 and $500 credit card spend, total eligible transactions will be $5400, which translates to an interest of 1.90% p.a. For savings of $30,000, the interest earned will be S$569.40 annually. Now, if a fresh graduate also makes monthly investments with either DBS or POSB apart from salary credit and credit card spend, he or she will be able to get min 1.80% p.a. For investments, it includes any trading/purchase of stocks done on DBS vickers account or any monthly investments with POSB Invest Saver. If this fresh graduate has a salary credit of $2500, a credit card spend of $200 and an investment of $100 with DBS/POSB, he or she will get 2.00% p.a. This is higher than most other bank accounts out there currently. Now, the most important thing is whether the new DBS multiplier account is the best in the market? I've looked through the account and various interest rate tiers which they have and concluded that they offer the highest interest in the market currently. Just 2 criteria and you will get a minimum of 1.55% p.a. For scenario 1, the interest earned on DBS multiplier account is 1.85%. The only bank that match up to this rate is BOC. However, for BOC, the minimum salary credit is $2000 and minimum credit card spend is $500 which is quite restrictive. For DBS, there is no minimum salary credit or credit card spend. Only need to meet above $2000 to get higher interest. It seems like even the more popular ones like OCBC and UOB does not match up. For scenario 2, the interest earned on the DBS multiplier account is 1.90%. All the other banks fall behind with only SCB being the closest at 1.88%. For scenario 3, the other bank accounts clearly does not benefit anyone with less than $2000 salary credit but for DBS, they still give higher interest as long as you can meet a combined eligible transactions of S$2,000 per month. This is a life saver for those who could not qualify for higher interest from other banks due to their salary. The new DBS multiplier account clearly distinct itself among the competition of higher interest bank accounts. This will cater to new groups of people who prefer flexibility and avoid the trouble of having to meet minimum credit card spending or pay 3 bills etc. This will also cater to those who have not been able to meet the minimum salary credit or the pay 3 bills or minimum credit card spending requirements from other banks. Its time to let this group of people earn higher interest too. For existing POSB/DBS account holders, you just need to open a new multiplier account and put your savings into it to start earning higher interest. You do not have to change your salary crediting arrangements if your salary is already credited to any of your existing POSB/DBS account. It will automatically be detected subjected to T&Cs of eligible salary credit. 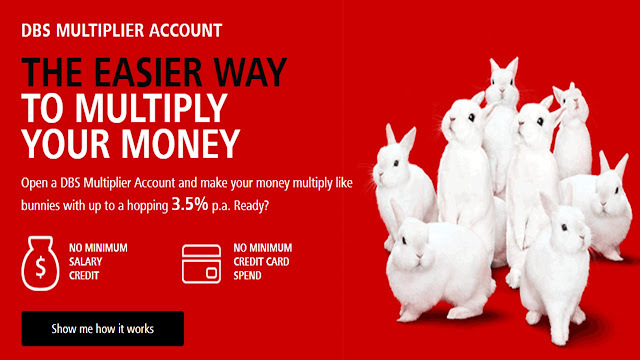 To find out more about the new DBS multiplier account click here. This article is written in collaboration with DBS. All ideas portrayed are independent by SG Young Investment.